In a previous post, we discussed Thomas Gallaudet’s connection with St. Paul’s Church, and how for 125 years a ministry to the deaf was a significant part of our witness in the city of Albany. We have also described two other figures in that ministry: Thomas Berry (the St. Paul’s curate who, in the early 1870s, organized the deaf ministry at St. Paul’s Madison Avenue mission) and Harry Van Allen (a St. Paul’s communicant who became missionary to the deaf throughout New York State). Today’s topic is yet another member of St. Paul’s who ministered to the deaf both here and across the State. William Maurice Lange, Jr. was born in 1909. At age ten, he contracted spinal meningitis and lost his hearing. He was educated at the Albany School for the Deaf on Pine Avenue, and like Harry Van Allen, attended Gallaudet College, graduating in 1934. Lange married a college classmate, and the young couple settled in Albany, where William worked in his father’s pharmacy on Dove Street. 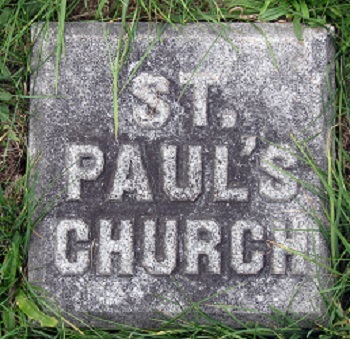 William Lange had not been raised in the Episcopal Church, but he was attracted to the programs for the deaf at St. Paul’s Church. Through his attendance here, he found himself called to full-time ministry. While preparing for ordination, he led services as a lay reader at St. Paul’s. It was during that same week that Father Lange became deaf after being stricken with spinal meningitis. And it was just 24 years later, to the week, that Father Lange took over from the Rev. Van Allen. So, in 1943, William Lange began a ministry very much like that of Harry Van Allen. From his home base in Syracuse, he officiated at an average of 275 services each year, with one thousand communicants in twenty-two congregations spread over an area of 43,600 square miles in the dioceses of Albany, Central New York, Rochester and Western New York. In 1944, he reported, “I cover over 17,000 miles a year by train, bus and shoe-leather.” By 1952, with access to a car, he traveled 32,500 miles. The Diocese of Albany honored Lange’s service by making him an honorary canon in 1963; in 1967, Gallaudet University granted him an honorary doctorate. We don’t know much of the later years of his ministry, but he was active until his retirement in 1976, at age 67. William Lange died in Syracuse in 2009, shortly after his 100th birthday. This entry was posted in Clergy, Deaf Ministry, Free Chapels on August 10, 2016 by Paul Nance.